Mexico’s Zapatista Army of National Liberation, EZLN, announced Saturday that it will begin selling organic coffee from Chiapas in order to help migrants persecuted by U.S. President Donald Trump. Working alongside allied international distributors, the EZLN will use coffee sale funds to provide financial assistance to U.S. deportees in Mexico. They will also use funds to support pro-immigrant resistance groups around the world protesting anti-immigrant governments. The project is part of the group’s “Global Campaign against the Walls of Capital,” which calls for worldwide immigrant solidarity against detentions and deportations. “It’s 100 percent Zapatista coffee, cultivated in Zapatista lands by Zapatista hands,” EZLN insurgent subcommanders Moises and Galeano wrote in a statement. Since Trump’s election, the radical Mexican group has worked with its international support group, the Sixth Commission, to “support the resistance and rebellion of those who are persecuted.” This includes calling for boycotts of pro-Trump commercial and media organizations while providing free legal assistance to those in need. Despite the EZLN’s participation in fundraising and electoral politics, the group continues to advocate for mass civil resistance as its primary form of struggle. “Always remember that we must resist, we must rebel, we must fight and we must organize,” Moises and Galeano also wrote in the statement. The EZLN, inspired by Mexican revolutionary Emiliano Zapata, became active in 1994 after Mexico joined the North American Free Trade Agreement. Since then, the group has declared war against the Mexican government and its allied multinational corporations. Correction: This article originally claimed the Zapatistas were founded in 1994. The group were actually founded in the early 1980s, but became public much later, on Jan. 1, 1994, when NAFTA officially came into force. On November 15, members of eleven municipalities in Chiapas began a twelve-day pilgrimage through communities threatened by neoliberal development projects, ending in San Cristóbal. The Movement in Defense of Life and Territory (MODEVITE) is a project of indigenous Catholic parishes practicing liberation theology, known the Pueblo Creyente, or Believing/Faithful People. “We seek to organize the peoples to construct our autonomy; that our right as original peoples to the life that we want is recognized. We need to join our voices in defence of our forests, our rivers. We demand the governments stop the extractive industry and the mega-projects that are being imposed without consulting us,” said one priest. After traveling through 11 states, the Caravan of Mothers of Disappeared Migrants wrapped uptheir eighteen-day tour in Tapachula, Chiapas on December 3. Forty-one parents from Central America made the trip to call attention to the attacks, murders and disappearances of Central American migrants in Mexico and to denounce Enrique Peña Nieto’s Southern Border Plan, implemented at the behest of the U.S. in 2014, which has gravely increased the risk to migrants travelling through Mexico. In the autonomous indigenous communities of Ejido Tila and San Sebastian Bachajón, statements have been issued decrying attempts by local politicians to incite violence in the communities in order to justify the entrance of the state in order to crush their autonomous projects. In Bachajón, the community has identified Juan Jiménez as the one responsible. As it happens, Jiménez is a local leader of MORENA, the “leftist” party of Andres Manuel López Obrador. In Tila, the community has barricaded the entrance to the village to prevent paramilitaries or provocateurs from entering. During a meeting to resolve a labour dispute in Ixtacomitán, four teachers belonging to the dissident CNTE branch were shot by gunmen linked to local politicians and the mainstream, sell-out SNTE union. Roberto Díaz Aguilar was killed and the three others wounded. And of course we can’t talk about Chiapas without mentioning the Zapatistas. They’ve released four statements – two jointly with the National Indigenous Congress – in the past three weeks. The first, “It’s Not the Decision of One Person”, is an angry rebuke to mainstream critics of their proposal to run a presidential candidate for 2018. The second outlines the schedule for the conclusion of consultations and the planned announcement on the decision of whether or not to run a candidate. The third is a lengthy “Story to Try to Understand.” At over 30 pages, I have not read it yet, but it is an explanation as to how the Zapatistas arrived at the decision to propose the idea of participating in the presidential elections. The fourth statement denounces the attacks on indigenous peoples in Mexico, and gives a nod to Standing Rock, all while confirming that the community consultations over the proposal continue. The reactions were immediate. Andrés Manuel López Obrador, the darling of the liberal electorate, was furious. He blames the Zapatistas for his losses in 2006 and 2012, and now they seem poised to interfere again with his presidential plans. Meanwhile, some anarchists pointed out that this proves the Zapatistas aren’t anarchists and that those who support the EZLN have been duped. 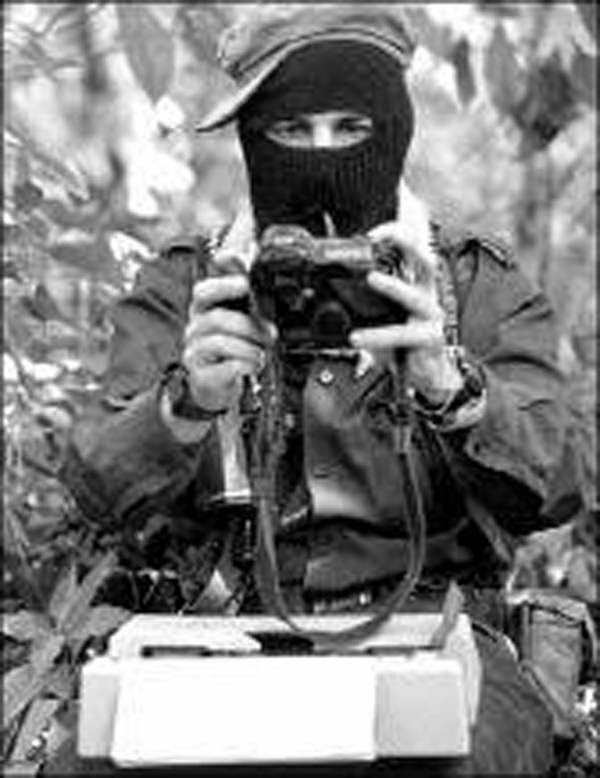 Never mind that the EZLN has never claimed to be an anarchist group. On the authoritarian left, Mexico’s Socialist Workers Party could barely contain its glee over the news, emphatically endorsing the EZLN’s proposal. The Zapatistas responded with a defensive and irritated statement largely arguing that this proposal is valid due to the impact it would have on the spectacle of electoral politics in laying bare the racism and sexism inherent in that process. A few days later, another statement communicated that the CNI and EZLN will announce the decision to run a candidate or not on January 1. They also said the “Zapatistas and ConSciences for Humanity” gathering will begin in Chiapas on December 25. In reading and discussing these developments with compas in Mexico, the generally attitude seems to be to wait and see what happens. Some feel it is a publicity stunt, designed to provoke just the sort of reaction it did, and that this will be made clear on January 1. On the other hand, if a joint CNI-EZLN candidate is put forward, then a re-evaluation by many anti-authoritarians would have to occur. While some of what they are proposing is interesting – to have an indigenous woman as president guided by the decisions of an assembly – to consider entering the electoral arena strikes many as a betrayal and is difficult to reconcile with the EZLN’s strident critiques of the system and power. To flirt with electoral politics even with the goal of détournement is to engage with a system fundamentally opposed to liberation, designed to consolidate power and legitimize repression. Such a move seems more akin to Michael Moore and his ficus plant than the Zapatistas and their uncompromising, decades-long struggle for autonomy and self-determination. Stay tuned. In related news, a member of the CNI from the autonomous Tzeltal community of San Sebastián Bachajón was detained and severely beaten by a group led by a local government official. Two days later, on October 19, 800 police and 400 paramilitaries positioned themselves on the outskirts of that community. Fearing a raid, the alarm was sounded, but it appeared to just be an intimidation tactic. For other Chiapas news, be sure to check out Dorset Chiapas Solidarity’s Zapatista news summaries for September and October. In a joint statement published on September 2, the Fray Bartolome de Las Casas Centre for Human Rights (CDHFBC), Meso-American Voices and La 72 Shelter for Migrants, reported that the youth Maximiliano Gordillo Martinez, who was missing since May 7 when he was stopped at a checkpoint of the National Migration Institute (INM) in Tabasco, reappeared alive. They claimed that “the documenting and analysis of the case continues in order to define the terms of the follow-up”, while asking for “sensitivity and respect to the processes of healing and strengthening as concrete ways of expressing solidarity”. Given this panorama, human rights organizations, together with the family, made an urgent call for national and international solidarity to demand the immediate presentation with life of Maximilian, and “a comprehensive investigation into those responsible.” Among other actions, they invited people to sign and share the urgent action on the Avaaz website, and to widely share the story of Maximilian. On June 13, one month and six days since the forced disappearance of Maximiliano Gordillo Martinez, his relatives, representatives of his community parish (Socoltenango), members of “La 72” Refuge Home for Migrants, Mesoamerican Voices, Action with Migrant Peoples and the Fray Bartolome de Las Casas Centre for Human Rights (Frayba), called a press conference to denounce the negligence of the authorities in this case. In their statement entitled “Between Ineffectiveness and Concealment” they expressed their worries above the integrity and safety of Maximiliano given that his whereabouts are unknown to this date. They declare that they have “gone to the competent authorities, demanding that they fulfil their duties in the prompt, complete and impartial investigation that this event deserves.” Nevertheless, they indicated that they received no reply. They explained that have “lodged a formal complaint with the Attorney General of the Republic (PGR), in which we have provided the necessary elements to indicate the participation of agents of the National Institute for Migration (INM) and the Tabasco State Police in the forced disappearance of Maximiliano”; and they report that “to date, the behaviour of the PGR has been insufficient, inefficient and slow, given that instead of getting down to an exhaustive search for Maximiliano and an investigation of the responsible officials, they have subjected their action to excessive bureaucracy […] which leads us to ineffectiveness and government concealment.” The PGR and INM have “closed ranks to deny that the name of Maximiliano Gordillo Martinez appears in their national and regional registers at any moment as a declared or deported migrant.” They also reveal that they have been “denied access to complementary information that allows elucidation of what happened that night on the route he was traveling, consisting of the identification of the agents who carried out the operation at the stated checkpoint, the collaboration agreements between the INM and Tabasco State Police, videos from the various installations of the INM, among others. In a [call to] Urgent Action on May 18, 2016, the civil organizations Mesoamerican Voices, Action with Migrant Peoples A.C., the Fray Bartolome de Las Casas Human Rights Centre (CDHFBC, also known as Frayba), and The 72 Hogar Refuge for Migrants, denounced the enforced disappearance of Maximiliano Martinez Gordillo, an 18-year-old native of Tzinil community, Socoltenango municipality, Chiapas. On 7 May, he was detained by people who presented themselves as agents of the National Migration Institute (INM) and unidentified elements of the police, on the road from Comitan de Domínguez, Chiapas, to Playa del Carmen, Quintana Roo, to where he was travelling to look for work. Six or seven people who did not have official voter identification were taken off the vehicle, including Maximilian. Realizing that he was being accused of being an undocumented migrant, he showed his original birth certificate and CURP as proof of his Mexican nationality, as he had no voter identification. However the agents claimed that they were false documents. The last time Maximiliano was seen was in the migration office, where there were between 15 to 20 more people detained by the INM. The INM has denied registration of Maximilian in the national system of INM, and has not provided more information to assist in his search. A complaint was filed with the National Human Rights Commission (CNDH), a body that reported the INM denial that there was any detention of migrants on the date referred to along the entire said route. A complaint was filed with the District Attorney’s office of the Highlands, Chiapas. Banner reads: Believing People of the southeast with Pope Francisco against mining and for the defence of our Mother Earth. Beyond the condemning discourses about the Pope’s visit to Chiapas, accusing the event of being a form of control of the masses that responds to the need to recuperate the faith of the few faithful Catholics who are left in the region, faced with the increase in the number of Evangelicals and in the desire of government authorities to show the “good Indian,” it’s pertinent to analyse the relevance that the Vicar’s presence acquires for an important percentage of indigenous Catholic believers. If the visit to Tuxtla could be omitted from a profound analysis it doesn’t come out the same with the Diocese of San Cristóbal de Las Casas, where the largest percentage of the population is indigenous, with a diversified rural economy and grouped together in a diocese that for more than fifty years has shown particularities of significant social resistance. The influence of the diocese in the region is highly important if one remembers the theological and political tradition inherited from Bishop Don Samuel Ruiz, who presided over it from 1959 to 1999. Many of the political, indigenous and campesino organizations, which currently contend in the state’s political arena have their germination in the 1974 Indigenous Congress, where, for the first time, secular catechists from the different diocesan regions had the opportunity to discuss the common problems about which they complained: mistreatment, discrimination, exploitation on the fincas (estates), dispossession of their land, abuses from those monopolizing crops, a lack of school and health services, threats and violence. The 1974 Congress, organized by the Diocese, was the inaugural parting of the waters for a new stage of resistance and empowerment in the communities, generating campesino movements and the formation of numerous groupings demanding agrarian redistribution. One could argue against the importance of the Diocese of San Cristóbal with the decrease of Catholics in the state. Nevertheless, while it’s certain that religious diversity has increased in Chiapas, provoking social problems of expulsions and religious intolerance, it’s also necessary to say that despite that the Catholics continue to represent the most numerous religion among the Indigenous population. The data provided by the INEGI in its latest document on the theme, 2010 Panorama of Religions in Mexico, contradicts the diagnostics that point out that Indigenous Catholics have been exceeded at 60%. It is possible to observe that in a population of 1,209,057 speakers of any indigenous language, Catholics represent 50.35% with 608,819 followers; on the other hand, the total of Presbyterians, Evangelicals, Protestants, Christians, Jehovah’s Witnesses, Mormons, Jews and Muslims is 450,257, in other words 34.25%; the rest don’t point out any religion. Nevertheless, in opposition to the heterogeneity that religious secularization represents, Indigenous Catholics, even with their doctrinal particularities, compose a more cohesive sector, the majority subscribed to the universal church, which has permitted an important number of them to mobilize constantly in order to work in favour of social justice and for the defence of native territories. This organized sector is recognized as “Pueblo Creyente (Believing People);” a name that Bishop Samuel Ruíz designated in his time for the indigenous people of faith that demonstrated in the streets against the unjust incarceration of the parish priest of Simojovel, Joel Padrón, who in 1991 would denounce the numerous human rights violations in the northern part of Chiapas. He was accused of conspiracy against the government, criminal association, plunder, robbery, threats and provocation, among other crimes. Pueblo Creyente’s tenacious resistance attained his freedom despite all the state pressure. Pueblo Creyente, now with more strength, has added itself to different processes of resistance and solidarity. However, the history of struggle and congruence for the social welfare was made palpable years ago. For example, in the 1980s, during the period of Guatemalan refugees, through the diocesan Solidarity Committee, camps, basic education courses, workshops for artisans and for analysis of the reality were organized and steps were even taken for the definitive stay of some Guatemalans on lands acquired by diocesan agents. These same agents accompanied the organized return to Guatemala, earning the respect and gratitude of thousands of former refugees forever, a recognition that not even the United Nations High Commission for Refugees attained. The mediation of the Church of Don Samuel has been so important in the region and so polemical that during the juncture of expulsions of “Christians” in San Juan Chamula, the diocese condemned the acts perpetrated in said municipality, promoting dialogue. That also provoked the expulsion of the Catholic Chamulan followers of Don Samuel and the rupture with the Diocese of San Cristóbal, since the expellers opted for the Orthodox Catholic Church. Within this context the Diocese promoted religious tolerance and supported the re-accommodation of those expelled, thereby showing their first practices towards ecumenism. The very same territory of this diocese has been the scenario of the Zapatista Uprising, which is not a simple fact: it’s enough remember the notes of Jan de Vos, who Subcomandante Marcos assured in an interview that the meeting between the guerrillas and the catechists of Don Samuel, in the middle of the Jungle, permitted the first ones to transform their “squared” vision of the world into “round.” It’s not too much to say that the tijwanej method of “receiving and returning the word to the community” and “discussing among everyone to interpret the reality and to carry out actions” is a contribution from liberation theology to Zapatismo and not the inverse. At the same time, it’s appropriate to remember that the rebellion in the Cañadas (Canyons), had its germ in the migration of indigenous campesinos, supported by the Jesuits, to the Jungle from the fincas of Ocosingo, Altamirano and other places and that many catechists and church agents were accused, after the Zapatista Uprising, of being promoters of the revolt, as Andrés Aubry, Carmen Legorreta and Xóchitl Leyva point out. The nomination of Samuel Ruiz to participate in the dialogue with the federal government as part of the CONAI was also a demonstration of the analytical ability of the church’s agents and of the trust that the communities had deposited in the Catholic Church, especially in its bishop. Among other work of great importance the diocese also founded the Fray Bartolomé de las Casas Human Rights Centre; the civil association Economic and Social Development of Indigenous Mexicans (DESMI, its initials in Spanish), in charge of incentivizing and advising agro-ecology production in various communities; and the Support Commission for Unity and Community Reconciliation (CORECO) that since the Zapatista Uprising had the charge of promoting the resolution of inter-community conflicts through dialogue and promoting peace. The response to the diocese’s attempts at pacification and justice, however, has awakened little sympathy in the state and federal governments. It’s appropriate to point out the case of Father Miguel Chateau, the parish priest of Chenalhó, extradited by the federal government after having denounced the characteristics and type of training had by the paramilitaries who perpetrated the massacre of Las Abejas in Acteal. The response was the deportation and condemnation of the diocese for its intervention. Stories like these are repeated in all corners of diocesan territory. There are the recent threats against Father Marcelo Pérez of Simojovel, who is opposed to the increase of organized crime, the cantinas, the sale of drugs and prostitution. Pueblo Creyente supported him with a pilgrimage of dozens of kilometres through various municipios, given that his “enemies” offered a reward of up to a million and a half pesos for his head. Pueblo Creyente’s request that Father Marcelo meet with the Pope to tell him the crime situation in Chiapas was blocked from the current top leadership of the San Cristóbal Diocese: he will not be able to interview with the Pope, although he DID achieve being present at the papal mass as animator of the event. Beyond the complicated conjunctures, which are not few, it is also necessary to point out the important work that the diocese carries out on a daily basis. Organized in its seven diocesan zones (central, south, Tzeltal, Tzotzil, Chol, Chab and southeast), the pastoral agents, secular deacons and catechists, carry out different tasks: through the social pastoral work they attend to specific problems in matters of human rights; gender equity –from the women’s commission, CODIMUJ-; youth advisory; support to migrants, among other actions. With the recently created Mother Earth Pastoral they seek to coordinate efforts in defence of territory, opposing the sale of land, the monoculture of non-indigenous species, the use of genetically modified organisms, the construction of highway and hydraulic mega-projects, the mining extraction, dispossession of land and migration provoked by the poverty that disarticulates the family nucleus. At the same time Pueblo Creyente demonstrates with pilgrimages against the structural reforms, against the genocide reflected in the country’s clandestine graves, against the disappearance of students like in the Ayotzinapa case, against femicides and against the private guards that subject the peoples. On this list of objectives Pueblo Creyente has also added the project of the New Constituent, feeling proud that Bishop Raúl Vera is one of its principal promoters. Pueblo Creyente nurtures its spirituality starting from Indian theology and continues –to the grumbling of the diocesan leadership and against the suspension dictated from the Vatican- ordaining permanent indigenous deacons: men from the community who serve at the side of their wives and with the support of their families the ministry of imparting the sacraments and of reading the word of God in light of the times; men and women committed to their communities in the project of achieving spiritual liberation, and pledged to eliminating social oppression. Nevertheless, perhaps the biggest challenge that Pueblo Creyente has is the equal proliferation of currents inside the diocese, where renewed and charismatic Catholics are opposed to the tasks of the pastoral agents who seek to construct a liberating church. The dispute inside Catholicism in San Cristóbal is between these two projects: a liberating church or a conservative one. An example of this contradiction was observed this January 25. Diocesan authorities were opposed to the pilgrimage in memory of the fifth anniversary of the death of Don Samuel Ruiz, with the justification that it was better to channel efforts to the Pope’s visit, but Pueblo Creyente, loyal to their pastor, who they call Caminante,  went to remember his work and honour it with the continuation of his work. During the event differences were evident between the current bishops that seek to discourage the Pueblo Creyente organization. For example, before starting the mass, the faithful that showed hand-painted signs in defence of territory were asked to put away their banners and slogans. Among other questions, this is the context that the Pope will encounter during his visit to Chiapas: a Catholic community in resistance starting with the base church communities and a sector of Catholics who seek to finish off Don Samuel’s project. Because of that the controversies are now harsh and unpleasant in San Cristóbal, where the “coletos”  feel excluded because the Pope decided to meet only with eight indigenous for sharing food. In 2015 there are almost one billion migrants and displaced persons. 232 million out of the country; 740 million in internal migration. Entire families migrate seeking work and food, fleeing natural disasters, forced displacement or refuge from the war. Half of those billion people are children. Downward pressure on real wages in the agricultural sector and NAFTA related destitution of Mexican farmers is likely to increase migration to the United States. 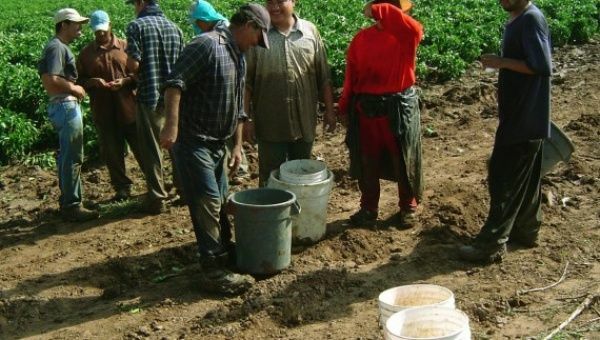 Mexican farm laborers earned less than three dollars a day in 2013 in Mexico, according to information released on Friday by the National Institute of Statistics and Geography (INEGI by its Spanish acronym). Farmworkers’ wages do not represent any more than 1.5 percent of the earnings of those who work in large corporations in Mexico, according to Inegi. In fact, the gap between the two sectors is so wide that a corporate executive only needs to work 5.6 days to earn what an agricultural worker earns in a year. Seventy percent of the field workers earn less than US $2 per day. Ninety-five percent do not enjoy any health or social security benefits. That puts Mexican field workers after China as the most exploited in the world, according to the World Bank. With conditions like these, it is no wonder that the United States federal minimum wage of US $7.25 is attractive. The National Council on Population (Conapo by its Spanish acronym) indicated that 400,000 people immigrate to the United States per year, many as undocumented workers. While many go to urban centers to work in restaurants and sweatshops, others continue working on farms all over the United States. Of all farmworkers in the United States, 75 percent were born in Mexico, 53 percent of farmworkers in the United are undocumented (without legal authorization), 25 percent are United States citizens, and 21 percent are legal permanent residents. According to U.S. Department of Labor’s Bureau of Labor Statistics, farm work generally pays more than US$9, but due to colder winters, the work is usually seasonal, strenuous and dangerous. And since more than half of the workers don’t have papers, growers can get away with paying less than $9. Immigration to the United States has markedly increased since the 1994 passing of NAFTA, a free trade agreement that has driven over two million Mexican farmers out of business. And the downward pressure on post-NAFTA real wages for farmers in Mexico will only serve to drive migration numbers up even higher. Members of Movement for Justice in El Barrio recently held a two day community assembly, to reflect on their principles and their daily struggle for dignity and against neoliberal displacement, and to continue to learn from the struggle and the principles of the Zapatistas. As part of the activities, they screened documentaries about the history of the last 30 years of struggle of the Zapatista communities and a new film about the Escuelita. New members felt humbled to learn about the dignified struggle of the Zapatistas. A new member was surprised that the struggle was so different from what they had read in the newspapers about the Zapatistas. Their preconceptions were challenged and destroyed by this community reflection. After watching the films and learning about the compañeras and compañeros, participants then discussed the 7 principles of the Zapatistas and reflected on how these principles relate to their own work organizing against displacement and for dignified housing in El Barrio. In this way, members of Movement for Justice in El Barrio continued learning from their Zapatista compañer@s.
Members also spoke about the struggle of Movement for Justice in El Barrio against multiple forms of oppression, including sexism, patriarchy, heterosexism, racism, capitalism, homophobia, xenophobia, transphobia – and how important this work is in a community organization struggling for social justice from below and for everyone. These migrants in struggle look to their Zapatista compañeras and compañeros as an inspiration in their daily struggle for justice for marginalized communities. The members were clear that the Zapatistas give them one more reason to continue in their local struggle in East Harlem, knowing that the compas are struggling to change the unjust system imposed from above upon those from below. 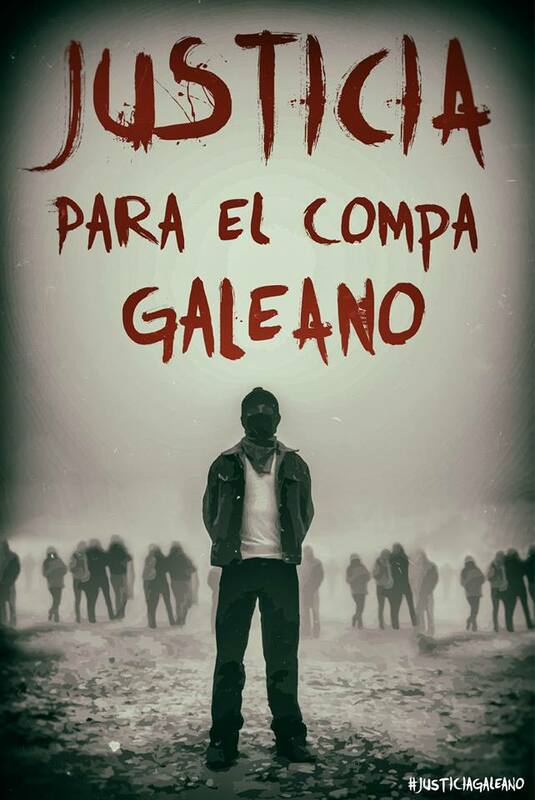 Finally, the members of Movement for Justice in El Barrio screened videos about compañero Galeano and his brutal murder by paramilitary forces. A new member expressed frustration that no one could turn to the government for justice because it was this same bad government which caused the death of Galeano and the destruction in the community. The members reaffirmed their support for the community of La Realidad. Overall, the participants in the meeting continued to learn much more from the Zapatistas which they can apply in their community organization. They will never forget compañero Galeano, but they will keep his memory in their hearts and in his memory they will struggle every day for justice and for the liberation of those from below. On May 24, hundreds of members of Movement for Justice in El Barrio from New York, mostly women of all ages, came together to honour the life and struggle of the murdered Zapatista from La Realidad, “Galeano”. For this event, the prominent Mexican feminist, activist and thinker Sylvia Marcos sent her reflections on Being “Jovena” (a young woman) and Zapatista in La Realidad. The women of El Barrio and the Zapatista women of La Realidad are two examples of how women in struggle all over the world are coming together to inspire and learn from each other, and how, in the process, women are transforming the world. Movement for Justice in El Barrio is a community-based organization, led by immigrant women, that works for dignity and social justice and against oppression, gentrification and displacement in El Barrio, New York. The organization was founded nearly ten years ago by Mexican immigrant mothers, many of them indigenous. They had been displaced from their native land and forced to emigrate, and now found themselves faced with racism, brutal landlords, appalling living conditions, and a constant threat of displacement. These women had never participated in social struggles in Mexico, and they did not speak English. But they started listening to their neighbours and realized that they all shared the same problems, and had the same needs: decent housing, a strong community, justice. The women started to go from door to door, building by building, listening to each other’s problems and thinking together about how they could be solved. 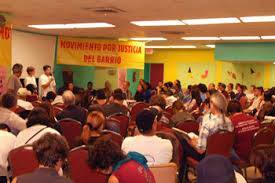 They gradually established a base and Movement for Justice in El Barrio was born. It is the women who have built the organization. Movement now has 850 members, in 80 building committees, of whom 80% are female. As immigrants, these women work very long shifts, 6 to 7 days a week, for very low pay, in addition to all the work they have to do at home. Many are mothers raising children. Despite these heavy demands on their time, they continue to be deeply committed to the struggle against neoliberalism and gentrification, and against the capitalist property owners, multinational corporations and government institutions who seek to displace them from, and destroy their community. With great determination, they still manage to make the time to organize with their fellow neighbours and to work to build a strong community base for the organization. The women of Movement for Justice El Barrio, the majority of whom are from the Mexican states of Puebla, Guerrero and Oaxaca, have been inspired by the remarkable struggles of women everywhere, but especially from their Zapatista compañeras in Chiapas. They share many experiences and basic principles, including the fundamental importance of “listening” (something women are very good at doing), the belief that the collective defence of the community is essential, the importance of making each other’s struggles their own, and how if one is affected, all are affected. Like the women of El Barrio, the Zapatista women are also indigenous Mexican women in struggle, though in a rural rather than a city-based environment. The members of Movement, as adherents to the Sixth Declaration of the Lacandon Jungle, see their struggle as a form of urban Zapatismo, and have adopted various tools of struggle and methods of organizing used by the Zapatistas in Chiapas. One of these is the “Consultas del Barrio”, neighborhood consultations in which all local residents are consulted, thus ensuring that members of the broader community of El Barrio are able to decide the direction of the organization. The Consulta is an excellent example of participatory democracy and horizontal decision-making used to build and strengthen community at a local level, and an ideal way of bringing more people into the struggle. One form of the Consultas del Barrio is the community-driven consultation, where members–mainly women–ask people from their community to identify the issues that most affect their lives, through town hall meetings, public forums, community dialogues, street outreach, door knocking, house meetings, and a community-wide vote. Movement then campaigns around the issues selected. Another Zapatista tradition that Movement has used successfully in both New York and Mexico, again with women at the forefront, is the Encuentro (Meeting or Gathering). They define it: “An Encuentro is a space for people to come together, it is a gathering, a place where we can all speak, we all listen, and we can all learn. It is a place where we can share the many different struggles that make us one. An Encuentro seeks to be a bridge between dignified peoples from across the city and around the world.” The Encuentro helps to bring together and strengthen the many struggles of marginalized communities and their organizations, and to form networks of mutual support and solidarity between them. Members of Movement believe it is of great importance to recognize and celebrate the amazing contributions of women to the struggle against neoliberalism and discrimination in all their forms. In El Barrio and throughout the world women remain at the forefront of these struggles – developing strategies, imparting wisdom, building community, and fighting tirelessly for justice and dignity for all. These women show great courage in the face of violence and aggression, and great strength and dignity in standing up against oppression, while working together and supporting each other. El Barrio holds a special celebration every year for March 8, International Women’s Day. This year the women of the Movement for Justice in El Barrio gathered together and, following the annual tradition, all received a red rose on arrival, followed by a dinner prepared and served by the male members so the women could fully celebrate and enjoy the evening. The programme began with a slideshow of photographs from the past year showing women of Movement for Justice in El Barrio leading and participating in actions and community assemblies, often with the children demonstrating beside their mothers. The event also featured a documentary about the 2008 Gathering of the Zapatista Women with the Women of the World, in which Zapatista women, young and old, told of their lives and dignified struggles. Women from many other countries also spoke, while the men cooked, washed dishes and cleaned, just like the men during Movement for Justice in El Barrio’s celebrations. Another video focussed on the role of women in movements all over the world, with the message “Women’s Struggles Transform the World.” Everyone was truly moved by the images and words of women in struggle in cities and countries around the world: Egypt, Greece, South Africa, Chiapas, the Philippines, Tokyo, Madrid and New York. A vital part of the celebration of International Women’s Day in El Barrio is the recognition of the role and achievements of the women of Movement for Justice in El Barrio, who have assumed much of the leadership and are seen as examples of “Indignadas” in this immigrant neighborhood. Women were celebrated and honoured this year for their tireless work in grassroots outreach, listening to their neighbours and creating a strong base in the community. The membership recognized several brave women of the organization who had stepped up into the media spotlight during the year to expose their landlord, who had been threatening and harassing them. All these women have showed outstanding courage and commitment to the growth of the organization and to getting their neighbours together to fight for justice and in defence of their community in El Barrio. The migrants from El Barrio had much to celebrate at this event, including their remarkable victories over the past year in a year-long battle led by the women against a new landlord who has some 1,800 apartments. This landlord has been targeting his tenants based on their perceived immigration status. A film showed women leaders of the building committees in public interviews denouncing injustices without fear of retaliation from their abusive and influential landlord. This is the most recent in a long series of battles by the remarkable women and men of Movement for Justice in El Barrio against property speculators, multinational corporations, corrupt politicians and government institutions that seek to displace them from their community. The daily struggle continues, and in turn, inspires others. On International Women’s Day, and every day, the women of Movement for Justice in El Barrio support each other and fight for rights, justice and dignity for their community in El Barrio, for the women of the world, and for all those who are excluded and marginalized by neoliberal globalization. Jessica Davies is an activist and contributor to the Americas Program at http://www.cipamericas.org. 1. Sup Moisés Describes What Is Needed to Rebuild the Autonomous School and Clinic in La Realidad – In his communiqué Subcomandante Moisés describes in detail the materials and equipment necessary to rebuild the autonomous school and clinic in La Realidad which the CIOAC-H members destroyed in the May 2 attack in which Compañero Galeano was murdered. The communiqué is entitled A Meeting In La Realidad A Few Days Ago. Instructions for sending donations can be found here. 2. More CIOAC-H Attacks – Primero de Agosto, a pro-Zapatista Tojolabal community in the same region as La Realidad, denounced aggressions from the Independent Central of Agricultural Workers-Historic (CIOAC-H, its initials in Spanish) and another organization called the ASSI. The aggressions include provocations, threats, attempted murders, robbery and a land invasion. Those who murdered Compañero Galeano belonged to the CIOAC-H and the Zapatistas classified the organization as paramilitary. According to the denunciation, the paramilitary behaviour continues. See Zapatistas Denounce Attacks By Cioac-H Over Land Conflict. 3. Militarizing Mexico’s Southern Border: Chiapas – The Chiapas border with Guatemala has suddenly become an important issue. According to the Frayba Human Rights Center, complaints of human rights abuse have doubled since implementation of the new “security” program for Mexico’s southern border. Chiapas is Mexico’s southernmost state, bordering the Central American country of Guatemala. Militarization of this international border is the latest phase of the US-backed Drug War, allegedly designed to deter drug trafficking from Central America into Mexico. However, it is also aimed directly at deterring migration from Central America and officials report a sharp rise in the number of unaccompanied migrant minors and entire families fleeing the violence. Chiapas NGOs report that militarization has increased in Chiapas municipalities along the border, and there are Zapatista communities in those border municipalities. 4. US Ambassador Anthony Wayne Inspects Chiapas Border with Guatemala – For two days during the last week of June, the US Ambassador to Mexico, Anthony Wayne, flew over portions of the Chiapas border with Guatemala and met with commanders of the Mexican Army and Navy regarding security on that border. He also visited the large migrant detention centre (capacity 2,500 per day) and learned that Mexico has detained and deported 10,505 minors in the past year. The ambassador’s visit dramatizes the importance this issue has taken on and the importance of Mexico’s southern border. 1. Jose Manuel Mireles, Self-Defence Leader, Arrested – In April, we reported that leaders of the various self-defence groups from 20 Michoacán municipalities signed an agreement with the federal commissioner for Michoacán, Alfredo Castillo, and other government officials to “demobilize” and register their weapons. The deadline set for the demobilization was May 10. Not all of the self-defence leaders supported this agreement. In other words, the federal government divided the leadership. So, some of the self-defence members have registered their weapons and joined the rural police; while others have not. One of the self-defence leaders who did not register his weapons or join the rural police is Doctor Jose Manuel Mireles. Instead, he criticized the government’s role in Michoacán. Soon after he led a group of armed autodefensas into the small town of La Mira, federal police and members of the Mexican Army and Navy arrested Mireles and 69 others (later reports say 82) accompanying him for carrying unregistered weapons. 2. Guerrero’s Community Police Suffer Internal Division – On June 21, one community police agent died in a confrontation between the two opposing factions in a struggle for control of the San Luis Acatlán House of Justice. The Regional Coordinator of Community Authorities-Community Police (CRAC-PC, its initials in Spanish) suffered a serious internal division this year, which some attribute to the government’s interference in this autonomous project. More information here. 3. The FPDT in San Salvador Atenco Struggling to Defend its Land Again. – The People’s Front in Defence of Land (FPDT, its initials in Spanish) is once again facing the threat of losing some of its farmland to urban development and a new airport in Mexico City. On June 1, the ejido assembly approved a measure that would permit the conversion of agricultural lands into private property, thus opening the door to a new Mexico City Airport and the Ciudad Futura (Future City) Project. The ejido Commissioner is a PRI member and the FPDT emphasized the “irregular and illegal” nature of the assembly and said it would take legal action as well as engage in social protests. The FPDT is remembered for the valiant defence of its land and marches with machetes raised from 2001 to 2002, after the federal government’s first effort to construct the new airport on Atenco’s land. See Indigenous Community Near Mexico City Again Stands Ready To Fight For Its Land. 1. 52,000 Unaccompanied Migrant Minors – The tragedy of children attempting to migrate without a parent or other adult relative has overwhelmed US immigration facilities; and those are only the children that get caught! The Pew Research Institute reports the following percentages for the countries of origin of unaccompanied children apprehended between October 1, 2013 and May 31, 2014: 25 percent are Mexican, an equal percentage are Guatemalan, 29 percent are Honduran and 21 percent are Salvadoran. 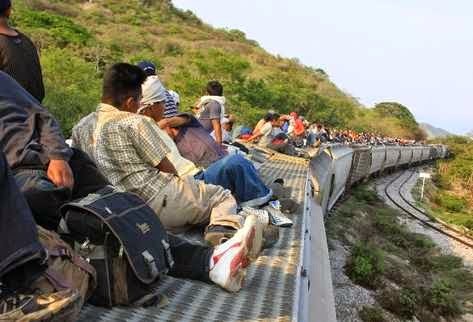 This is a dramatic increase of Central American children. The United States has agreements with Mexico for returning the Mexican minors promptly. That is not the case for the Central American minors. The US government must find housing for them while their immigration cases are processed. Many of the Mexican and Central American children are fleeing the violence of criminal gangs and drug traffickers, trying to reunite with parents who are working in the United States. Many have asylum claims. Immigration reform would grant relief to others, but the US government seems incapable of reforming that obsolete system. Compiled monthly, by the Chiapas Support Committee. The primary sources for our information are: La Jornada, Enlace Zapatista and the Fray Bartolomé de las Casas Human Rights Centre (Frayba). Following an operation in which they captured more than 320 Central American migrants who were walking the road between Tenosique, Tabasco and Emiliano Zapata, agents of the Federal Police and the National Migration Institute assaulted staff of The 72 migrant shelter, Rubén Figueroa, Fray Tómas González and Fray Aurelio. After learning last night [Wednesday] that authorities had detained the caravan of migrants, 72 staff members came to the social center of the community of Chacama, Tabasco, where the migrants were being held. “They hit me in the face, they knocked me to the floor, and a migration agent pushed Fray Tomas and almost fractured his arm,” Figueroa to Proceso. He said that the agents knew who the defenders of migrants were, and that the migration representative for Tabasco was present. “Everyone knew who we were,” he added. He explained that when they reached the community centre, he found the frightened migrants. Women and children were screaming and crying, he said. Authorities boarded the migrants on several buses, which headed towards Villahermosa [capital of Tabasco, on the Gulf of Mexico]. But Figueroa didn’t know their final destination. Mexico City – Civic organizations and social activists reported a new migrant crackdown, this time in the state of Chiapas, and they demanded that the government of Enrique Peña Nieto adhere to the principles of humanity, asylum, support and guarantee of rights that should govern the country’s migration policy. In a press statement, they said that at about 4:00 AM agents of the National Migration Institute, supported by the Federal Police, arrived at the municipality of Pakalná and arrested a group of undocumented migrants. According to the text, the activists received reports that during the raid a sexual assault took place and several of those arrested were injured. The 88 signers of the document demanded that the federal government put a halt on any deportation proceedings, and they demanded the immediate release of migrants arrested last April 30 in an operation in Tabasco, while they were trying to reach the municipality of Emiliano Zapata. That day, they said, immigration agents and police forces engaged in cruel and inhuman treatment. 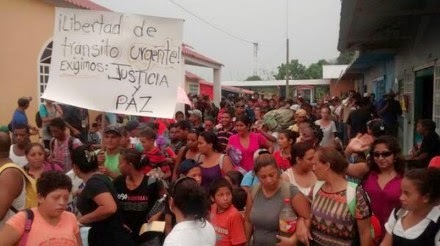 Yesterday, the Shelter House for Migrants, “La 72,” and the Mesoamerican Migrant Movement reported that on April 30 approximately 300 undocumented Central Americans were arrested by the Federal Police, Tabasco State Police and the National Institute of Migration. They explained that at about 7:00 PM, state and federal authorities set up an immigration checkpoint 40 kilometres [24 miles] from [the municipality of] Emiliano Zapata. A group of Central Americans were headed to Emiliano Zapata on foot because they had been prevented from boarding the freight train, known as “The Beast,” heading to the United States. It is this group that the authorities ambushed in the Chacamax community. The police operation caused the migrants, in disarray, to try to flee towards the hills in the area. Those who were not arrested “are hiding in the forest, and there are children left alone,” they noted. On 30 April, close to 300 migrants, including three pregnant women, an elderly woman, and several children, were arrested and assaulted by agents of the Federal Police (PF) and the National Institute on Migration (INM) as they were marching on the federal highway from Tenosique to Emiliano Zapata, Tabasco. The human-rights defenders Rubén Figueroa, Fray Tomás Castillo, and Fray Aurelio Tadeo, who were carrying water and food to support the migrants, were beaten by the federal police close to the community of Chancamac, Tabasco. 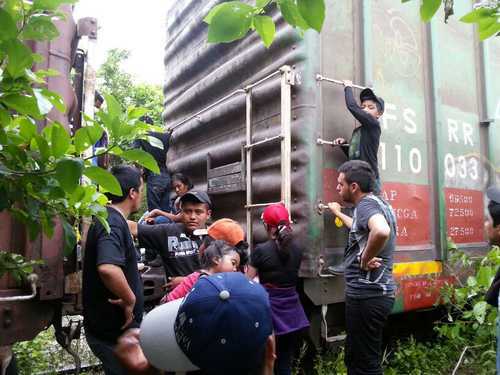 Beyond this, on the night of 1-2 May there was a second mass-raid against migrants, and close to 150 persons who were sleeping in the train station of Palenque, Chiapas, were detained by INM agents together with federal police. Nearly a hundred migrants succeeded in evading arrest by taking refuge in the migrant home in Palenque. The detained were taken to the migrant station in Palenque, and it is feared that they will be deported. Having already spent some 10 days stranded at the migrant shelter The 72, in Tenosique, Tabasco, [near the Guatemala border] after being prevented from boarding the freight train better known as “The Beast”, 320 Guatemalans, Hondurans, Nicaraguans and Salvadorans yesterday made the decision to continue walking on their migratory route to the United States, activist Rubén Figueroa, a member of The 72, reported to Proceso. Since Easter, train engineers working for the company Ferrocarriles del Istmo de Tehuantepec [Isthmus of Tehuantepec Railway]-operator of the Chiapas-Mayab [Yucatán] railway route, which connects Mérida [Yucatán] with Coatzacoalcos (Veracruz) [along the Gulf of Mexico]-have blocked access to train, says the activist. “They just told them not to climb on, and if they do, they disengage the cars,” Figueroa added. Meanwhile, Gustavo Villanueva Baca, CEO of the Isthmus of Tehuantepec Railway, assured Proceso that he knew nothing about engineers preventing access to the train. According to him, Tenosique “is not a loading station”, so the train doesn’t stop there. “As a cargo carrier, I don’t have the right to provide transportation services to persons; however, I can’t forbid anyone climbing on the train,” he explained. But according to Figueroa, for 10 days only locomotives have passed through Tenosique because when migrants climb on, they disengage the cars.” The activist relates that given the denial of access to the train, yesterday [Tuesday] at four in the afternoon, the migrants who were in The 72 shelter asked to speak with him. “They announced to us that they intended to move on,” says Figueroa. The director of The 72, Fray Tomás González, [winner, last December, of the ‘Gilberto Bosques Franco-German prize in Human Rights] explained to them via telephone that, while the shelter staff couldn’t accompany them, they would monitor to see that nothing happens. “Go ahead,” the friar concluded. In undertaking the walk, the migrants have two objectives, Figueroa explains: “First, to continue on their way [north]; and demand freedom of movement.” The second objective represents the primary demand of Figueroa and the Mesoamerican Migrants Movement for many years. On Tuesday April 15, Figueroa led the “way of the cross of the migrant” whose purpose was to carry out the symbolic crucifixion of a migrant on “The Beast” on Good Friday [April 18]. However, on Wednesday, the 16, engineers didn’t allow the caravan of migrants to get on the train, so they had to keep walking. Through the support of several organizations, by walking and on buses, they made it to Mexico City on April 23. Thanks to the mobilization generated by the caravan-bringing together over a thousand Central Americans under the slogan “freedom of transit”-the Government of the Federal District (GDF), the Secretariat of Government Relations (Segob) and the Senate received a delegation of migrants. Following these meetings, Segob gave them a 30-day pass to cross Mexico or return to their countries of origin. “The migrant caravan generated a loss of more than 52 million pesos for organized crime, given it costs about 4 thousand dollars to travel through Mexico, taking into account the kidnappings and extortions,” Figueroa said. The new group of 320 migrants left the shelter at 7:00 pm on Tuesday. They slept in a park in the community of Crisóforo Chiñas under the impressed watch of the villagers, who were unaware of the impending arrival of hundreds of migrants. When shelter staff took breakfast to the caravan on Wednesday morning, Figueroa and Fray Tomás González learned of the surprise of the villagers and decided to change the strategy: Now they are going ahead of the group to advise communities of the arrival of the caravan, “to see how they can provide support, “says Figueroa. This Wednesday, at three in the afternoon, the caravan of migrants was 25 kilometers [10 miles] north of Tenosique and was approaching the community of Arena de Hidalgo. 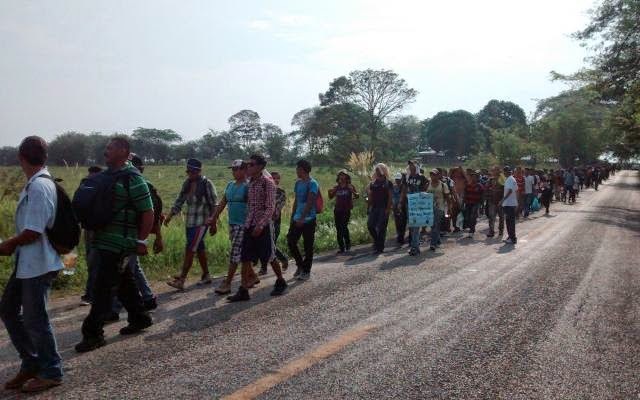 Migrants and their families as well as activists and human-rights defenders launched a “Migrant Pilgrimage” on 15 April in El Naranjo, Guatemala. They passed through Chiapas, Villahermosa, and Tabasco. 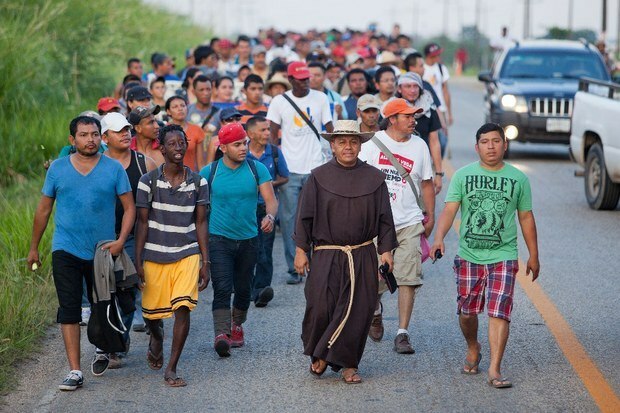 At that time, a total of 800 Central Americans had joined the caravan. Starting on 19 April, passing through Holy Week, the procession became the “March for the freedom of transit of migrants.” Through these mobilizations, participants sought to call attention to the lack of security experienced by Central American migrants upon crossing through Mexico to arrive in the U.S.: murders, kidnappings, extortion, rapes, robbery, and exploitation are part of their daily bread. On 23 April, having now more than a thousand participants, the march arrived in Mexico City, where protestors confronted the President, demanding an audience with Enrique Peña Nieto. However, they were received only by a commission that handed over their petitions calling for free transit to the United States. Fray Tomás González, migrant defender at the home “La 72” in Tenosique, Tabasco, reported that on 24 April they were to have two meetings, one with the Secretary of Governance and the other at the Senate of the Republic. On behalf of the immigrant women of Movement for Justice in El Barrio, it is an honor to share with you the following statement of solidarity sent to us from our sisters and compañeras at Filipinas for Rights and Empowerment (FiRE). Born in 2007 in New York City, Filipinas for Rights and Empowerment (FiRE) is a leading grassroots women’s organization that fights against oppression at the global and local levels by connecting the “Filipino diaspora to the women’s struggle in the Philippines.” FiRE organizes both immigrant and non-immigrant Filipinas “across class, gender, sexual identity, and age lines” to lead their own struggle for justice and against imperialism. In this powerful statement, our compañeras from FiRE issue a clear and resounding message of solidarity, hope, and struggle to our Zapatista compañer@s who are facing severe government-backed repression. As women of color and immigrants from a country that has endured a similar history of colonization, imperialism, and repression, our compañeras from FiRE affirm that “As political repression continues, we must stand and fight together against such atrocities. We are stronger united in our shared struggle.” With this statement, our campaign, and the global struggle for justice of which it is a part, reaches new heights. The struggles of those from below, in particular women, are strengthened each time they meet and share. Long live solidarity amongst those from below! Long live our compañeras of the Philippines! Long live the indigenous peoples of the world! In response to the Worldwide Echo in Support of the Zapatistas. Warm militant greetings from the women of Filipinas for Rights and Empowerment (FiRE) – GABRIELA USA in New York City! We express our sincere and heartfelt solidarity to our brothers and sisters of the Zapatista communities in Mexico that have suffered government repression through displacement and imprisonment. The Mexican government targets these indigenous communities because Zapatistas are building an alternative form of living where people have sovereignty over the land and pursue justice for indigenous people. To our companeras and companeros of San Marcos Aviles who were displaced for over a month from their community, we stand together with you in your fight against the corrupt government that imposes such cruelty. To our companeras and companeros in prison due to trumped up charges especially Francisco Santiz Lopez, we will spread the truth and demand your freedom. In response to these acts of injustice and outright brutality – we vow to fight against these forms of violence. The Mexican government has no right to threaten the indigenous communities and their people. Your struggle is our struggle. In our homeland, we suffer similar repressive conditions at the hands of the Philippine army and government. Since 2001, hundreds of Filipino men and women have been abducted, killed, tortured, imprisoned, and displaced by the Philippine military that is largely financed by US imperialists – and still to this day no justice has been served for these crimes. The victims of government repression are organizing and resisting like the Zapatistas, creating and building communities and fighting for justice and social and economic reforms. As political repression continues, we must stand and fight together against such atrocities. We are stronger united in our shared struggle.